The Joint Council (Fællesrådet, abbreviated “FR”) is the supreme body of PF. FR makes the executive decisions for PF, such as approving committees, student representatives for DTU’s boards and councils and PF’s budget. The Joint Council can be contacted through the Joint Council’s Executive Committee at frfu@pf.dk. FR consists of 2-3 students from each Student Council, and PF’s Board also attends all meetings. FR has meeting approximately once a month during the academic year. The Joint Council’s Executive Committee (Fællesrådets Forretningsudvalg, abbreviated FRFU) is responsible for ensuring that PF’s Laws and Statutes are complied with in connection with the convening and holding of Joint Council meetings and that the work of the Joint Council is planned and performed in a sensible manner throughout the year. This includes convening FR meetings, nominating keepers of minutes and conductors, and following up on the decision made by FR. If you have any questions about FR, any items for the agenda at an FR meeting, or anything at all related you are always welcome to contact FRFU at frfu@pf.dk. 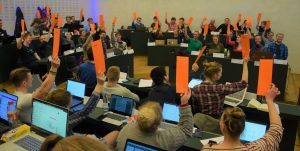 The Joint Council wants its activities to be accessible to every DTU student. It primarily holds its meetings in Danish. Though several initiatives have been put in place to make them as accessible as possible. The agenda for all meetings is available in English, and all appendices are required to have an English resume or a complete English version. FR has also made the possibility of a translator for non-Danish speaking members available, though it needs to be coordinated with FRFU before the meeting if necessary. If you need anything in relation to FR that is not available to you in English, please do not hesitate to contact the Joint Council’s Executive Committee at frfu@pf.dk. Minutes are kept at every Joint Council meeting. Though the minutes are kept in Danish. The open minutes are available at the following links. Everyone is welcome to submit an item for consideration by the Joint Council. And as a rule, every item should be accompanied by an appendix. You might also want to add an appendix to an existing item, typically a basis for candidacy, to an election. You are expected to use the official templates when submitting an appendix. It is acceptable to submit an appendix only in English. Rules for appendices are available in New in the Joint Council. 2 weeks prior to the FR meeting (Tuesday at 11:59 pm), ensures FRFU time to give feedback on the appendix. This ensures that it has time to be ready for the meeting. And provides a high probability of being ready for the preliminary convening. 1 weeks prior to the FR meeting (Tuesday at 11:59 pm), FRFU will usually have time to give feedback on the appendix. This provides a high probability of being it being ready for the meeting. Friday at 11:59 pm the week before the FR meeting is absolutely the last chance. This option means the FRFU will not have time to give feedback. If the appendix/item is not deemed important it will most likely be postponed to the next meeting. The date of the next FR meeting can be found here on the Danish version of pf.dk. This is a list of all FR meetings in the current FR year. It is not kept in English. To find the agenda in English, first click on the word “Bilag” under the date, to open the appendix folder. Then open the file named “FR###-English”. If the “Bilag” link is not available, then the agenda is not yet available. If you have any other problems, please do not hesitate to contact FRFU at frfu@pf.dk.